Sometimes one little detail can change the whole outfit and make your look from boring and simple to trendy and unique! 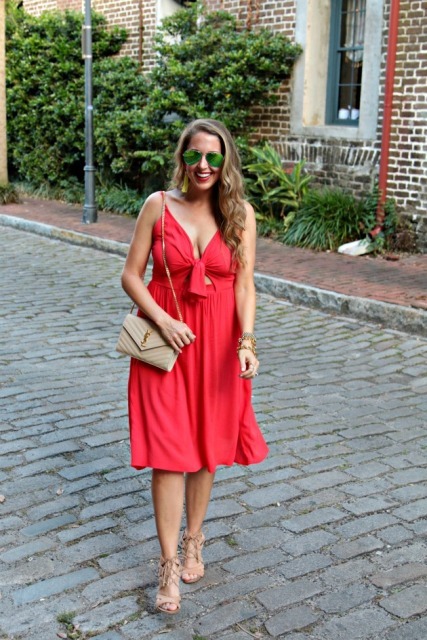 As an example, you should pay your attention to tie front dresses that are gorgeous and so comfy for summer days. Now you have a really difficult choice, cause there are so many various stylish tie front dresses. So first of all, you need to decide what type of dresses you want, then start to think about the length and colors of your new piece of clothes. For more eye-catching looks you can pick up printed dresses (for example, polka dot, striped or floral ones). Now for more ideas scroll down. If you love to wear shirtdresses, then you will like our next ideas. Firstly, you can take a white and black checked knee-length tie front shirtdress and combine it with a red suede bag and white sneakers. Secondly, if you’re a big fan of monophonic pieces of clothes, then try to repeat a combination of a white mini shirtdress, white embellished flat sandals and a brown clutch. 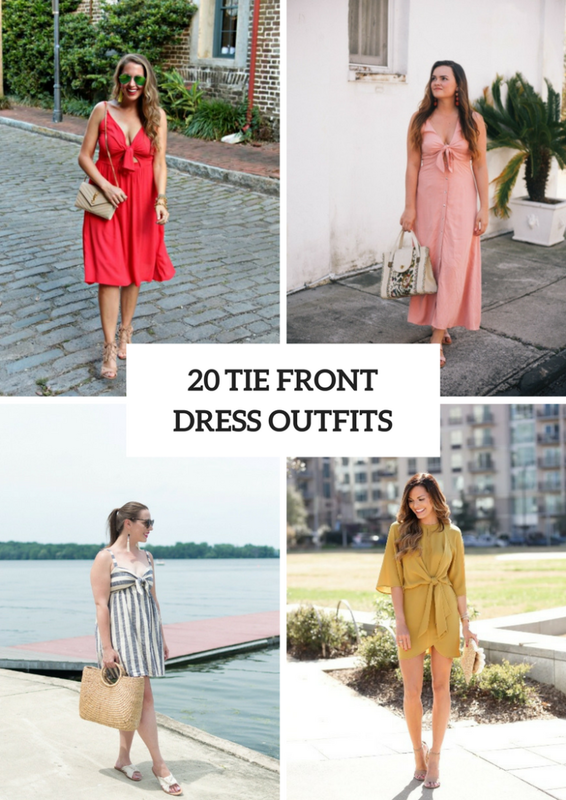 And, thirdly, for hot summer days choose a sleeveless tie front mini shirtdress and mix it with white sneakers and tassel earrings. To create beach outfits, you can pair a striped mini dress with a white sandals and a big straw bag. 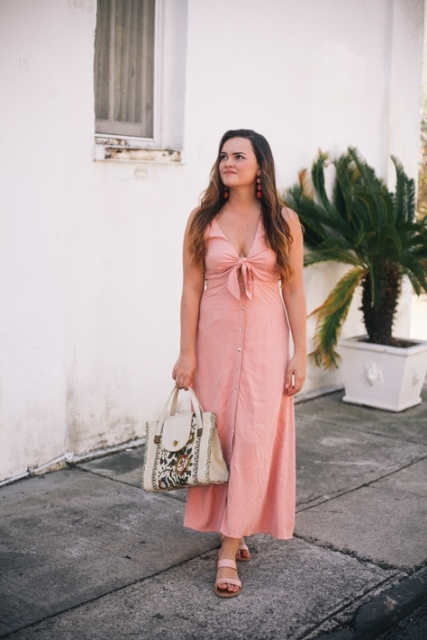 Or combine a pink maxi dress with pale pink shoes and a white bag with a floral print. 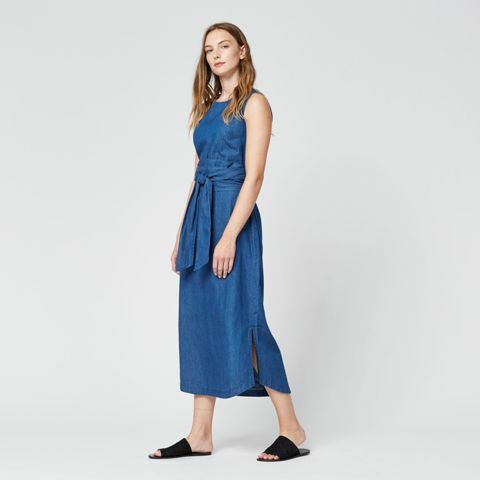 Such dresses are perfect for cocktail party or event outfits. For example, you can combine a white airy knee-length tie front dress with beige patent leather pumps, sunglasses and a white clutch. Or choose an elegant mustard yellow cape sleeve dress and mix it with a ruffled clutch and gray high heels.